The training fire extinguisher allows trainers to minimise training expenses. Refillable in less than 5 minutes, they use water to simulate the extinguishing agent. Compared to conventional fire extinguisher charging, it pays for itself in less than 7 refills! 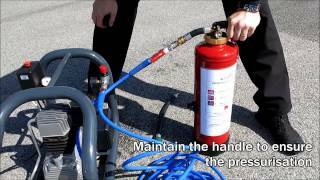 The appearance and operation of a training fire extinguisher is similar to that of conventional fire extinguishers. Refillable with a compressor in 5 minutes by the trainer, it generates a jet that allows the trainees to confront the flames by positioning themselves correctly. Essential equipment to complete the use of a flame generator during fire training, the refillable training extinguisher allows very concrete and practical training sessions at a lower cost. It helps avoid incorrect action or incorrect use.